Marv Albert and Mike Fratello discuss how the Nets got their game going in the second half and were able to beat the Clippers in overtime. Mike Fratello and Ian Eagle talk about how the Nets were able to beat the Los Angeles Clippers, 110-96. Statistics may not lie, but they cannot predict the future. They merely enable us to make our best educated guesses. Even with the most exacting analysis of player stats from years past there is no way to guarantee the assembly of a winning team – anything can happen. That’s what keeps both real and fantasy sports so exciting. Think about grabbing these guys a little earlier than you may have planned because they look to be underrated in some leagues and on the rise. With all the recent changes to the Nets organization from ownership on down, the team is hardly recognizable – which is exactly the look they’re going for. But there are still some familiar faces on the revamped roster who will be integral to the new-found success they seek. 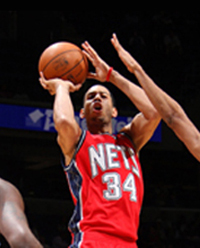 Former All-Star Devin Harris is back in action. Devin has the speed and quickness to create transition opportunities on offense. If he can stay healthy this season he will log a lot of minutes and score points. And All-Star-to-be Brook Lopez will help out Harris in the assists column. It will be interesting to see the relationship that Harris develops with new head coach Avery Johnson and whether he buys into Avery’s defensive philosophy. Ranked as low as 62, Devin is undervalued in some leagues so look to grab him in the 4th Round. When playing his best ball Devin ranks among the top point guards around. Coming off a phenomenal rookie campaign in which he led the Bucks to the playoffs, Brandon Jennings is arguably more valuable than a 20th ranked point guard. Jennings started in all 82 games and proved he can get numbers. In fact his first night out on the court as an NBA pro, Jennings wound up just one rebound and one assist shy of a triple double. Not to mention Jennings had a 55-point game against Golden State in November, setting the franchise rookie record. 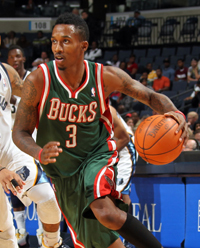 The Bucks hope Jennings will come back more mature and physically stronger than in his rookie year. He appears to take a very serious approach to his game, which should spell good things for him down the road. The Bucks are a better team this year so they have more weapons to brandish. Joining forces with a healthy Michael Redd and Andrew Bogut, Jennings will add tremendous value in Round 5. After signing a contract extension with the Bulls earlier this month, Joakim Noah can finally charge full steam ahead. He is a steadily improving player who has just scratched the surface of his potential. Noah plays with an energy and passion you have to love. His offensive game is continuing to develop. He is complimented by power forward Carlos Boozer, and once Boozer is healthy it will free up easy buckets for Noah. 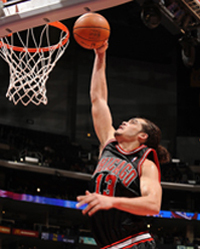 Noah is also an excellent rebounder, and he can block shots. If Noah’s plantar fasciitis does not affect him the way it did last year, I think his numbers will go up significantly. He is ranked 15th in the center pool but if he makes it to Round 4, consider it a steal. 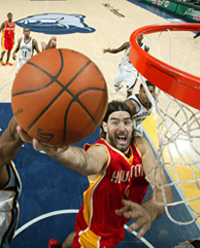 A ferocious rebounder and defender, Luis Scola is now the best player on the court for Houston. Filling in for Yao last season he was able to gain experience and showcase his talent, putting up 44 points against the Nets. His scoring has improved over the last few seasons and he’s versatile enough to face up and get the 18-20 foot jumper. Though Yao Ming has returned he will be playing reduced minutes so Scola will continue to put up points and grab rebounds in his fourth year with the Rockets. And with his workload lightened, Scola’s minutes should have more impact. The Rockets will have to play well to make the playoffs in the competitive West this season, and I expect Scola to lead the charge – perhaps earning his first All-Star appearance along the way. Ranked anywhere from 60-80 overall in most leagues, I value him as an early third-round pick. 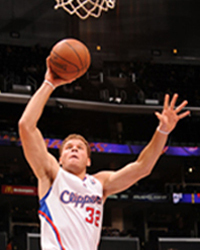 Returning from a lost rookie year, Blake Griffin looks healthy and raring to go. He is as athletic as they come and has much to prove to the NBA. Griffin is still considered a rookie, but he has no doubt learned a lot and gained valuable experience on the sidelines while recovering from his broken left kneecap. He has played very well in the exhibition season and has a legitimate shot at being a big-time contributor for the Clippers. Griffin will be their go-to guy and, as always, will rebound with the best of them. You can probably get Griffin as a late pickup in many leagues because he is an unproven entity and you still have to worry about whether his knee will hold up under the rigors of the NBA schedule. So pick him in the 6th Round.